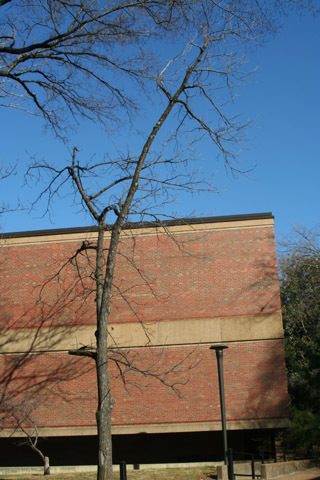 This walnut tree grows between the Rand loading dock lot and the Bishop Joseph Johnson center. It is not in very good condition, but it is featured because it has branches near the ground and it can easily be compared to a tree of heaven that is near it by the retaining wall overlooking the loading dock parking lot. For a description of the features of black walnut, click here. This organism is a living specimen that is part of the  Vanderbilt University Arboretum  with the local identifier 3-119.